The Gibson Les Paul Custom was introduced in 1952 as a "Top of the Line" model from the Les Paul series. The early versions were equipped with P90 and alnico V pickups, later on with PAF humbuckers. This luxury version of the Les Paul was preferably painted in black (hence the nickname Black Beauty), body, neck and headstock are provided with a 5 ply binding, the hardware is gold plated. The fingerboard is made of ebony and is provided with very flat dressed frets hence the name "Fretless Wonder". The Les Paul Custom 50s have a solid mahogany body. The Maple top first appeared on the reissued Customs in the late 60s. 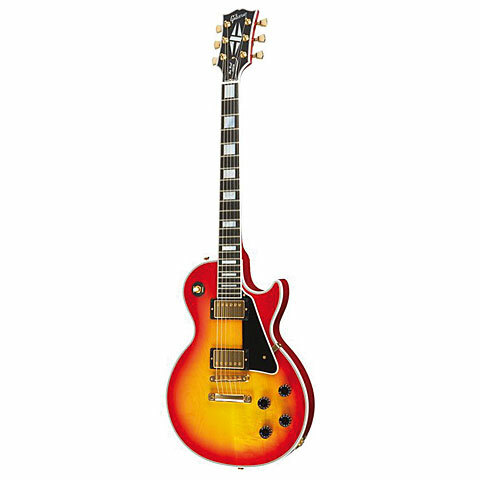 The Les Paul Custom is available in various versions and still the "special" Les Paul.